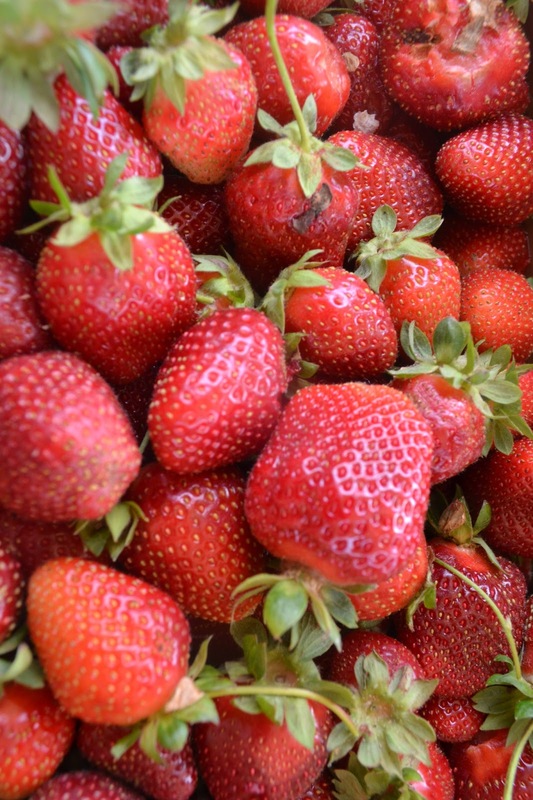 June & July are the best season for strawberries. We go to a local pick your own farm every year to pick ours, but even if you are at the grocery store,or farmers market, here are some tips for getting the most for your money. Tips came from my local papers's food section. Jan's Tip: Did you know that size makes no difference when it comes to sweetness? In the Refrigerator: Do not wash them until you are ready to use them or eat them, strawberries do not do well wet, and spoil more quickly . Store them loosely covered and dry in the refrigerator. To Freeze: Gently wash and pat dry the berries. Remove the hulls and flash freeze them on cookie sheets in a single layer unitl the berries are individually frozen. Then transfer the frozen berries to a freezer bag or container. Strawberries can be frozen for up to a year, however thawed berries will be soft. Ok so I know I just told you to pick the reddest berries at the store, but when baking a cake, bread or muffins, do not go for the reddest, ripest berries! Choose the slightly under ripe ones. Since strawberries are mostly water and the darker the berry the higher the water content, the ripe red ones will lead to soggy breads.